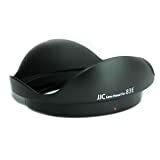 JJC lens hood easily attaches to your lens to ensure clean, clear shots in bright sunlight. Lens hoods are primarily designed to prevent unwanted stray light from entering the lens, by extending and shading the end of the lens. A dedicated lens hood is designed to perfectly match the specific focal length of the lenses it was designed for. Moreover, this hood features a non-glare matte finish on the interior surface, to further prevent or limit lens flare. And since the end of the lens is extended, you also get the added benefit of some extra protection from accidental impact. This entry was posted in Discount Photography and tagged 1022mm, 1635mm, 1740mm, Canon, EW83E, F/2.8L, f/3.54.5, f/4.0L, Hood, lens, Replacement by Ball Photo. Bookmark the permalink.